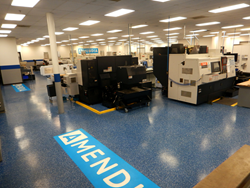 Amendia currently has one of the most advanced manufacturing facilities in the industry. “Our commitment to our employees, our customers and most importantly, the patients we serve, will be greatly enhanced by this site expansion,” said Chris Fair, Amendia's CEO. Amendia Inc., a leading developer and manufacturer of spinal implants, announces the expansion of its state of the art manufacturing facility in Marietta, Georgia. Amendia is one of the few vertically integrated spinal implant companies in the United States and currently has one of the most advanced manufacturing facilities in the industry. The expanded headquarters site will increase Amendia’s manufacturing capabilities, grow its ability to service and train surgeon customers, and increase the R&D efforts in early stage product development. The expansion is one of several strategic efforts under newly appointed President and CEO Chris Fair. “Our commitment to our employees, our customers, and most importantly, the patients we serve, will be greatly enhanced by this site expansion,” said Fair. “We will have the ability to develop and manufacture cutting edge technologies on site, as well as provide training to surgeons from around the world. This supports our 360 degrees of service to our customers, from conception to realization." Amendia Inc. was recently acquired by Kohlberg & Company, and has a commitment to invest and grow the product offerings as well as Amendia’s infrastructure to support its increased global sales efforts. The company anticipates significant growth from organic product development efforts as well as strategic acquisitions. To learn more about Amendia’s expansion efforts, and what they mean to your practice and patients, please contact Nikki Coleman, VP of Marketing, at ncoleman(at)amendia(dot)com or (770) 575-5237. Amendia, Inc. is a global spinal device manufacturer focused on the design, development, and distribution of innovative technologies and techniques for the spine industry. Headquartered in Marietta, Georgia, Amendia offers a comprehensive product portfolio, which features a superior biologics line coupled with cutting-edge spinal devices. Amendia aims to exceed surgeon and patient expectations by utilizing advanced engineering skills, as well as the guidance of talented surgeon leaders to create balanced solutions for spinal treatment. Amendia’s mission is to improve surgical outcomes and the lives of patients with spinal disorders by providing world class products and service. For more information, please visit http://www.amendia.com.